New Apollo 11 Movies Marks 50th Anniversary! Welcome back to Day Late Dollar Short! Due to life changes, we had to take a short break, but we are so happy to be back blogging and visiting with all of you! Thanks to all of you that kept up with us and asked about our site. Today, we have the great privilege of telling you about a new movie that is currently playing in theaters across America - Apollo 11. My family loves all things space, so we are really excited to see this morning and learn more about Apollo's story. The movie is only playing for a limited time and in a limited number of theaters if you are interested in seeing. Please check your local theater for possible showings and times, and if you do see it, please come back and leave me a comment. *Many thanks to Propeller Consulting, LLC for providing the product/product information. Opinions are 100% my own and NOT influenced by monetary compensation. I did/will receive a sample of the product in exchange for this review and post. Solo! Did You Get Your Tickets Yet? So, I know most of my Disney friends are already aware of the new Star Wars movie coming out this month. It's the story of Hans Solo and how his character came to be the historic figure we now know and love. But one thing you might not know is that Fandango is offering some fun items and events if you buy your tickets through them. One of the items available is a **FREE** collectible poster. It's free while supplies last. I always love going to new Disney movies, and it makes it even more exciting when they give away free promotional items and collectibles. To secure your free poster, click on this link or on the picture above! 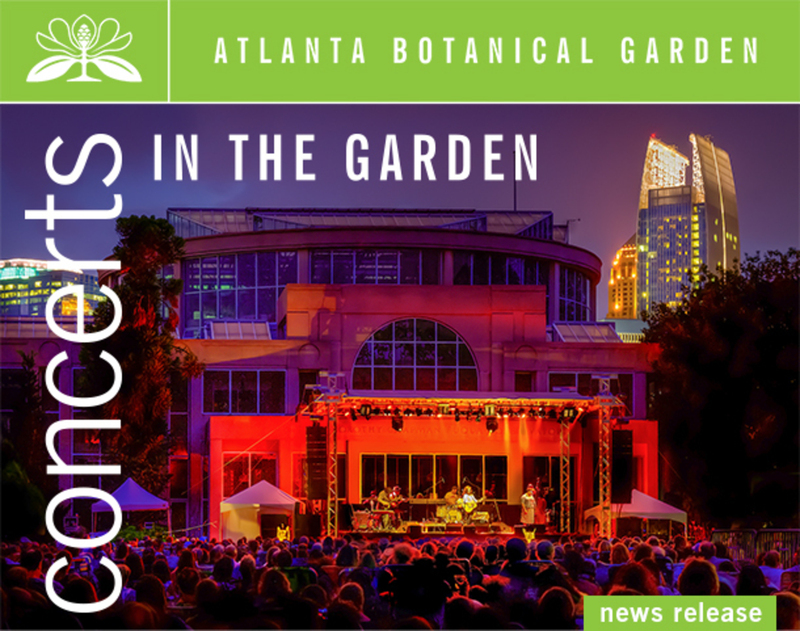 Atlanta Botanical Gardens - Concerts in the Garden Returns! Tickets for the 16th annual Concerts in the Garden go on sale April 6. Concerts in the Garden returns this summer to the Atlanta Botanical Garden with a diverse lineup of acts, both at the Midtown and Gainesville venues. Look for more acts to be announced this spring. Tickets are on sale at concertsinthegarden.org and at Garden admissions. Seating is general admission, and ticketholders are welcome to bring blankets or low-rise chairs. Cash bars and food purchases will be available. The mission of the Atlanta Botanical Garden is to develop and maintain plant collections for display, education, research, conservation and enjoyment. The Midtown Garden is located at 1345 Piedmont Ave. NE and open from 9 a.m. – 7 p.m. Tuesday through Sunday.. For information, visit atlantabg.org or phone 404-876-5859. The Gainesville garden is located at 1911 Sweetbay Drive, Gainesville, 30501 and open from Tuesday –Sunday from 9 a.m.-6 p.m. For information, visit.atlantabg.org/visit/Gainesville or phone 404-876-5859. Atlanta Botanical Gardens - Imaginary Worlds! Monumental, whimsical plant sculptures back this spring by popular demand. Imaginary Worlds returns this spring with a menagerie of all-new giant living plant sculptures sure to bring a smile as they take visitors on a fantasy journey throughout the Atlanta Botanical Garden, both at the Midtown and Gainesville locations. Back by popular demand, the exhibition, presented May 5 – October 28, recaptures the magic of the original blockbuster show from 2013 and 2014 with larger-than-life, topiary-like whimsical sculptures – only this time they’re even bigger. 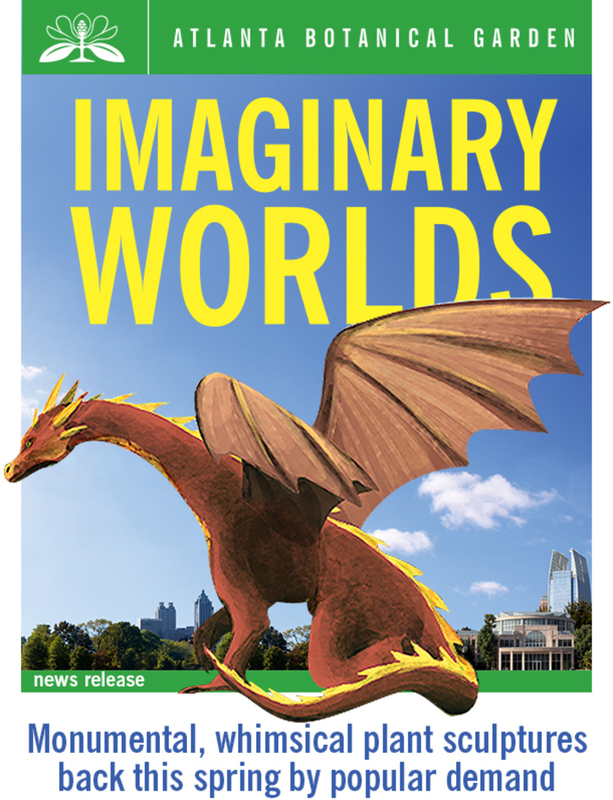 “Imaginary Worlds was just so incredibly popular with our guests that we just had to bring it back – but with an all-new twist,” said Mary Pat Matheson, the Garden’s President & CEO. This time, the sculptures – steel forms covered in a mossy fabric, stuffed with soil and planted with thousands of meticulously groomed plants – will be staged in 14 installations. At the Midtown garden, look for a giant Phoenix looming over the Alston Overlook, a mermaid lounging beside Howell Fountain, a massive dragon and sleeping princess near the Great Lawn, a woolly mammoth and a prancing peacock inside the Fuqua Orchid Center, and three towering camels lumbering through the Skyline Garden, to name a few. At the Gainesville garden, the landscape will be adorned with a variety of characters, including a friendly ogre, panda bears and frolicking frogs. This all-new cast of characters joins the Garden's permanent sculptures, Earth Goddess and Shaggy Dog, which are legacies from the original exhibition. “In addition to featuring all of the new characters, this exhibition is unique in that the sculptures are extremely large, much more so than the ones in the original show, and our own team of horticulturists will be planting them,” Matheson said. The process for creating the sculptures takes nearly half a year. It began last fall when conceptual drawings for the pieces were developed in Montreal, metal frames were fabricated, and plant palettes were chosen. The empty frames were shipped to Atlanta in January, and the Garden’s horticulturists began covering them with a mesh fabric and stuffing them with soil. Then the planting commenced – inserting more than 200,000 plants, primarily annuals, one by one. Because Atlanta’s winters are too cold for the annuals to survive, the sculptures were built in sections that were planted inside a greenhouse just outside the city, then trucked to the Garden in spring for assembling on site. Intricate irrigation systems beneath the surface of the sculptures allow the plants to grow – and the creatures to flourish – in Atlanta’s summer heat. Throughout the exhibition, guests will be able to also enjoy the sculptures in a whole new light at night – illuminated on Thursday evenings during Cocktails in the Garden. Expedia's Semi-Annual Sale Coming Soon! With the sun setting on spring break, it's now time to start thinking about summer vacations. For travelers looking to get a head start and save, Expedia is revealing details on the first-ever Expedia Semi-Annual Sale. In addition to deep discounts on hotels, car rentals, cruises, and activities, Expedia customers will also have exclusive access to cheap flight packages from Delta Air Lines. The sale begins April 20 at 9:00 a.m. PDT. With hotels and packages to hundreds of destinations on sale, the Expedia Semi-Annual Sale has something for everyone and every kind of trip. "Summer is one of the busiest travel periods, both domestic and international, and prices tend to go up as we get closer to that peak time," said John Morrey, SVP Brand Expedia. "Getting an early start on planning and booking can make a huge difference in terms of savings and availability for your perfect trip. 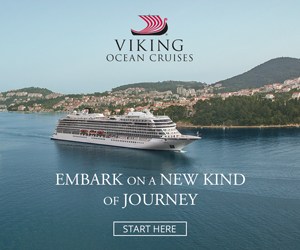 To sweeten the deal, we've sourced exclusive deals and rates travelers usually have to wait until Black Friday to find." The Expedia Semi-Annual Sale kicks off Friday, April 20, and runs through Monday, April 23. For four days, exclusive coupons and savings will be released and available for a limited time. Expedia.com ® is one of the world's largest full service travel sites, helping millions of travelers per month easily plan and book travel. Expedia.com (https://www.expedia.com/, 1-800-EXPEDIA) aims to provide the latest technology and the widest selection of top vacation destinations, affordable airfare, hotel deals, car rentals, destination weddings, cruise deals, and in-destination activities, attractions, services and travel apps. 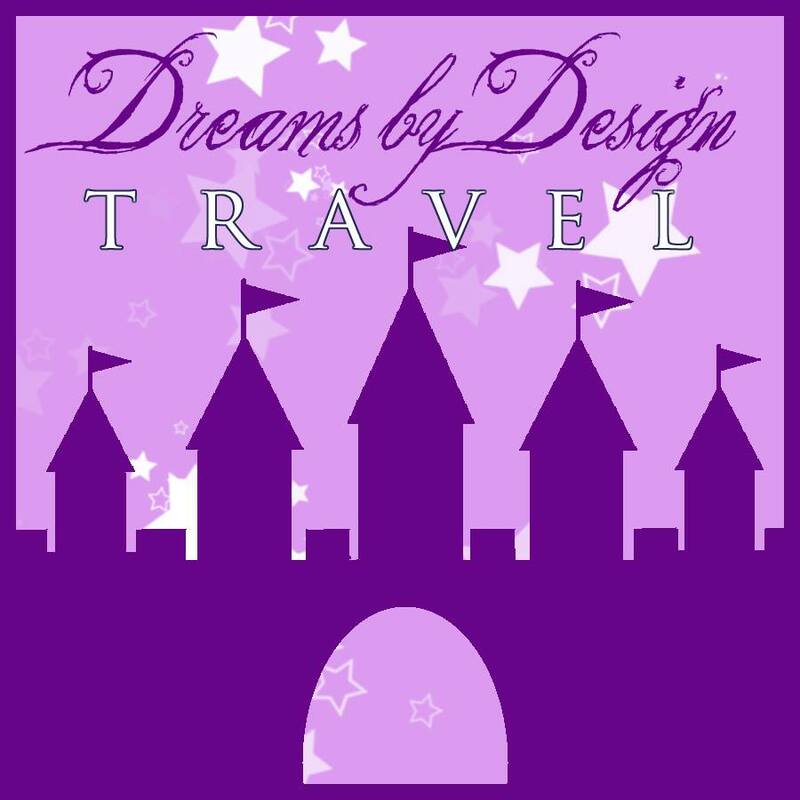 To take advantage of these great travel deals, please e-mail me at debbie@dreamsbydesigntravel.com! Paul, Apostle of Christ - New Movie on the Life of Paul Comes to the Nation's Theaters This Week! Let me introduce you to two men - Paul and Luke. You probably already know them. Paul was an Apostle of Christ. His letters were vital to the spreading of Christianity in the years following Jesus' death, burial, and resurrection. His writings now compose a majority of the New Testament. Luke was a physician and disciple of Paul. It is said he probably came to the saving knowledge of Christ through the teaching and friendship of Paul. Films like these are often hard watch because of the extreme suffering and abuse early Christians went through when the Church was born. But, we must them watch in order to remember, learn, and love the world around us. The Holy Spirit breathed great promise, wisdom, and knowledge through these two men. Paul, Apostle of Christ focuses on Paul and Luke's sharing of Jesus' message of love, redemption, and forgiveness. They shared it with a new church who, in turn, shared and spread it throughout the world. We can thank these two men for the Church we so love and adore today. Paul, Apostle of Christ will open Nationwide the week before Easter on Friday, March 23. It is rated PG-13 for violent content and disturbing images. To purchase tickets, please visit the movie's website. I hope you will join me this weekend to watch this very important film. Christians are showing America that we can hold an important key to Hollywood box office sales. No longer do we have to be recipients of violent films, horror films, or other dark, anti-Biblical material. This past weekend's surprise box office draw of, "I Can Only Imagine" shows Hollywood that if they will produce Christian-based and family-friendly films, audiences will show up in droves. Please help support more family-friendly and Bible-based films. Come see a film about a man that went from becoming the most notorious persecutor of the church to its most powerful proponent! Two men, bound together in their love for Christ. Leaving their final message for the world - "Love is the only answer." 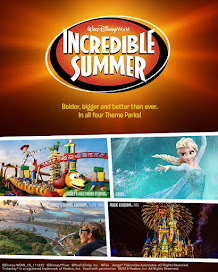 See you this weekend at the movies! *Many thanks to Propeller Consulting, LLC, Collide Media Group, and Columbia TriStar Marketing Group, Inc. for providing tickets to see the movie on its release in exchange for this promotional post. Opinions are 100% my own and NOT influenced by monetary compensation. It's Time Again! Cocktails in the Garden! Atlanta's favorite after-hours social returns. Atlanta's favorite after-hours social returns this spring! 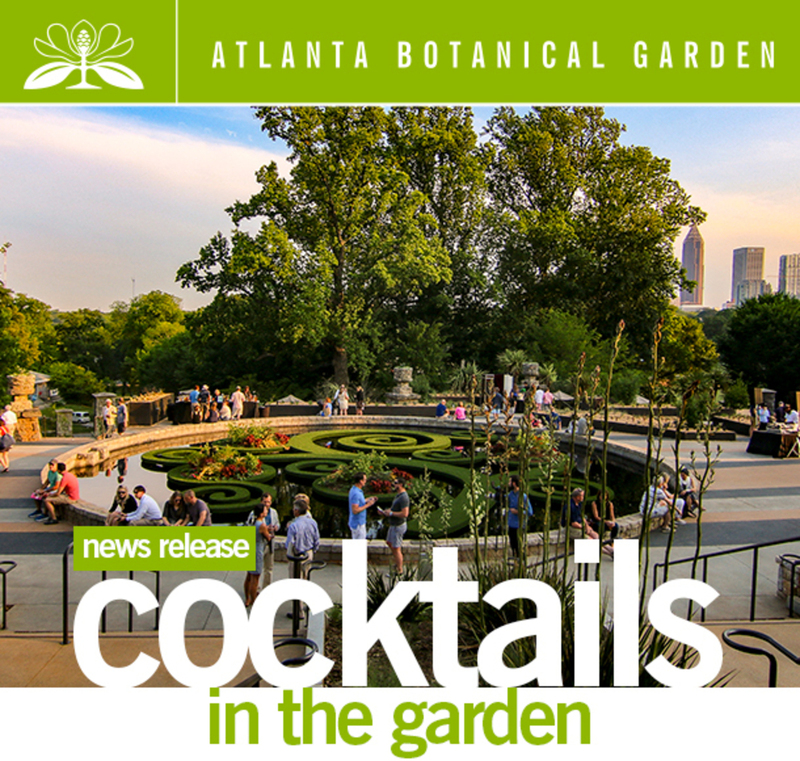 Explore the city’s lush urban oasis in the cool of the evening on Thursdays from May through September as Cocktails in the Garden returns to the Atlanta Botanical Garden. As an after-hours social for young professionals, a romantic date night for couples, or simply a fun friends’ outing for still others, the event – dubbed “social irrigation” – offers specialty drinks from full cash bars, deejays and live entertainment, and games and other activities. Set for 5:30 – 9:30 p.m., Cocktails in the Garden also is the only opportunity for experiencing the Garden in the evening, when the cooler temperatures at twilight cast the Garden’s thousands of beautiful flowers in a whole different light while drawing out their fragrance. In addition, guests may explore the Garden’s exhibition, Imaginary Worlds, featuring giant topiary-like sculptures made of mosaiculture, all set to a storybook theme. Finally, guests may round out the evening with a scrumptious dinner at the Garden’s Longleaf restaurant. Reservations are recommended.